Let us start by saying that The Anna Shelter, in Erie, PA., does a lot of great things for animals. We applaud them for this. Their shelter director, Ruth Thompson, has dedicated her life to saving animals. Unfortunately they also declaw cats at their West and East Erie and Corry, PA, Wellness Centers and they condone declawing for their shelter cats. We tried to see if Petsmart corporate or Petsmart Charities would try to inspire The Anna Shelter to do the right thing, educate the public about declawing, stop declawing at their Wellness Centers, and stop condoning it for their shelter cats but Petsmart charities wrote us back in Nov. 2018 and said, “PetSmart Charities works with nonprofit animal welfare organizations in good standing to help pets get adopted. We require the animal welfare organizations bring only healthy pets into our stores for adoption, and we have standard practices in place to help ensure these pets are healthy. Additionally, we regularly audit our partners to ensure they are in good standing. 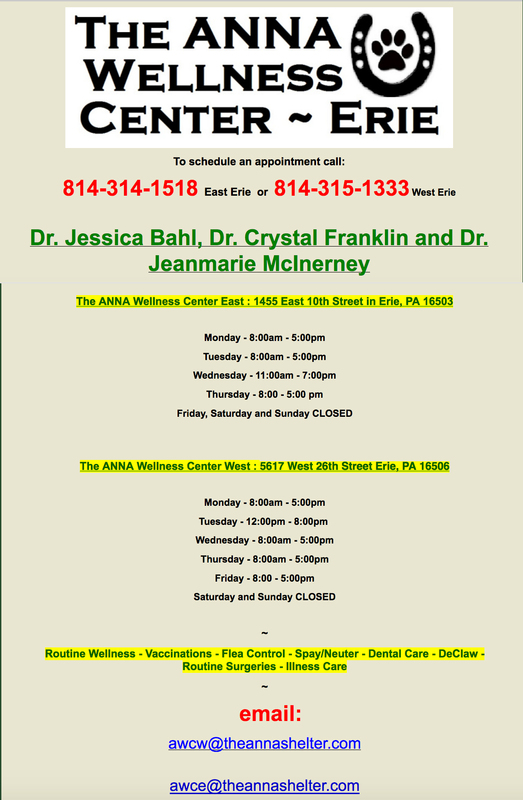 The ANNA Shelter director says that they all truly care about the welfare of cats but then says, “We try not give an opinion one way or the other” about declawing. Why wouldn’t they educate the public about the facts about this inhumane amputation procedure and about the easy, humane options so that less cats will have to go through this harmful procedure? Just to see how The Anna Shelter and their Wellness Centers address declawing, our researchers called them in late 2018, posing as a first time cat owners. Researcher spoke with a person on the phone at The Anna Shelter in Erie, PA and asked about adopting a cat. The person on the phone said they have around 140 cats for adoption. Researcher asked if they could get a cat declawed that they adopted from the Anna Shelter. The person said that it would be your own expense to declaw. They said they have some Wellness Centers that will still do the declaw. Asked if the declaw is cheaper at their Wellness Centers. The employee said it’s a couple hundred dollars at their Wellness Centers vs $3-400 at a regular vet clinic. The employee said that they can give you a brochure that has the Wellness Center phone numbers. Researcher asked about a declaw for two cats that will be adopted from the shelter. The employee said they can do declaws and it’s $130. They said they only do front paws. Asked about the best vet and they only have one vet who does the declaws, Dr Jeanmarie McInerney. Employee said she does them regularly and the cat will be ok after 2 weeks. Researcher asked about an age limit and they said that there isn’t one but if the cat’s over two years old they have to do an exam on the cat. You can just drop the cat off for the declaw. The vet, Dr Windell Lyon the one who answered the phone. Researcher said that they were adopting a couple cats from the shelter and asked about getting them declawed. Dr Lyon said, “we will declaw them here for you.” He said he does them Monday, Tuesday and Wednesdays and the cats go home the next day. He uses an electrocautery unit to declaw. He said that the younger the cat is the better they recover. He was asked if there’s an age limit, he said that he has declawed cats over two years old but likes to do them on younger cats because they do recover easier and it’s not as difficult on them. He said he has done declaws on all ages of cats. He said he does around 100 declaws a year. Researcher asked their cat would be ok long-term because they read some scary stories on the internet. Dr Lyon said he can’t guarantee that but he can guarantee that he will do the best job possible and he’s been doing them for 35 years. He said there can be complications afterwards like infections and things like that. The majority there are no problems he said. Researcher said they were adopting a cat at the shelter and asked if they declaw cats. Employee said they do declaws and they said the cat would have to get an exam first. They said that Dr Jessica Bahl is the best for the declaw and she does them regularly. The employee said there isn’t an age limit for a declaw. They said that Dr Bahl has to examine the claws first to “see if they are too tough, are they in good shape.” The employee said there are some cats that come in and their claws look really bad and there would be more involved to the declaw. So we reached out to the Executive Director of The Anna Shelter in an email on November 9, 2018. I’m the mom of City the Kitty. City’s cause it to help end declawing and educate the public about it and the humane options. I’m reaching out to you to ask you a few questions about your shelter. Why do you allow your adoptable cats of all ages to be declawed? Why do your “Wellness Centers” declaw cats? Why don’t you educate the public about the awful truth about declawing and how it is always harmful to the health and well-being of a cat. Why don’t you counsel cat owners about the easy, humane options like scratching posts, nail trims, deterrents, etc? Why don’t the employees and veterinarians at your Wellness Centers educate cat owners about the easy, humane options and that declawing is an amputation procedure that always harms the long-term health and well-being of a cat, when they call to book a declaw procedure? Instead of just profiting from this inhumane and barbaric procedure? Why don’t you have some info on your Anna Shelter in the FAQs on your website about the facts about declawing so that you can educate the public? If you truly care about the welfare of cats and are against animal cruelty you will stop allowing this barbaric, inhumane, and mutilating procedure to be performed on your kitties and at your Wellness Centers and you will help us educate the public about the awful truth about declawing. Hi – I’m sorry I am behind on emails and just now getting caught up. Quite honestly of our 5 staff veterinarians only 2 declaw cats. I’ve always felt it was up to them on the ethical side of things as they are the veterinary professional and know much more about this subject then me. I do know there is an age and weight limit however. We try not give an opinion one way or the other. We use scratching posts and put flyers in the adoption packs for soft paws and trim the cats nails before they leave for their new homes. We really do truly care about the welfare of the cats – but with 141 at the shelter right now and at least 12 to 15 calls a day about people wanting to bring more in and the overwhelming feral cat dilemma nationwide – I guess if I had to pick a life in a shelter, starving on the street or worse yet ending up in a kill shelter and being euthanized – I would choose to be declawed and live in a home. I know that sounds strange but the problem is so much bigger then even I imagined 15 years ago when I opened the shelter. The number of unwanted cats in this country is an epidemic and every shelter I know of is full. So if someone is willing to adopt a cat and the only way they’ll do so is to have it declawed…I guess it’s the lesser of the other evils I listed above. I hope this comes across as heartfelt as possible. I’ve dedicated my life and finances to the unwanted animals that come to the shelter and am blessed to be surrounded by others who share my passion. I totally respect your opinion and passion for your position and hope you can respect and understand ours. Thanks for everything you do to help animals find a loving home. I know what it’s like to dedicate your whole life to helping and protecting the welfare of animals. I gave up an award winning photography career and have worked for the last 4 1/2 years with this cause, 10-15 hr days as a volunteer to try to help end this cat cruelty. If you saw the suffering that I see in declawed cats, I think your opinion about this barbaric procedure would change. I understand the problems with too many homeless cats in our country but the facts are that if you educate the public about why declawing is always harmful to the health and well being of a cat and educate them about the easy, humane options then they won’t want to do this cruel and barbaric procedure to their beloved kitties. It starts with organizations like yours. Also, people who will only adopt a cat if it’s declawed aren’t good owners and, for a cat, it’s just as bad living in a bad home as it is being in a shelter. It’s like saying a child is better off in an unloving, abusive home than in foster care. I understand not wanting to give opinions on something but talking about the facts about declawing isn’t having an opinion. It’s speaking out against a procedure that is inhumane and mutilating and should never be done to a cat. Actually 3 of your vets declaw kitties. Dr Bahl, Dr McInerey, and Dr Lyon. None of your Wellness Centers tell first time cat owners, who call for the price of a declaw, that it is a very bad for a cat or ask what’s going on as far as scratching issues so they can give them helpful advice so they don’t need a declaw. And actually none of your three wellness centers say there is an age limit and only East says that if the cat is over 2 years old they need an exam. Dr Lyon says he does around 100 declaws a year and has declawed all ages of cats but likes to do them on younger cats. They all do declaws regularly they say which is sad to hear from an organization that says it provides “proper care” for animals. Ruth, the majority of shelters and rescues in America are against declawing,they educate the public about the facts, and give out brochures and information about the easy, humane alternatives and the awful facts about declawing. Do you need more information and studies that show the facts about how declawing is very harmful to a cat? Would you please consider doing the right thing and helping us with this cause and saving your kitties from this horrific amputation procedure by not declawing cats at your Wellness Center and by educating the public about it and the humane options? Your shelter even tells cat owners that your Wellness Centers are cheaper for a declaw than going to a outside vet practices. That’s pretty much advertising your toe amputation procedures and profiting from this cat cruelty. I hope you take this to heart and stop condoning this inhumane procedure and take a stand against it. I never received a response so I sent her an email on March 3, 2019. I’m reaching out to you once again to see if I can inspire you to do the right thing and take a stand against declawing at your shelter. You say that you try not to give an opinion about it but why not just give the facts like almost all rescues and shelters do in America? Why not give out brochures with the facts about declawing and about the easy, humane options? Why stay silent about a procedure that mutilates and harms a cat’s health and well-being for life? When most people know what the procedure entails, they don’t want to do it to their beloved cats. Don’t you feel it’s your duty to at least try to protect the cats that you are adopting out from this inhumane and unnecessary amputation procedure? Many people aren’t aware that declawing is a mutilating amputation procedure that involves cutting through ligaments, tendons, nerves, and tissue to remove the last toe bone in a cat’s paw. Most people aren’t aware that declawing is banned in 42 countries and not performed in most of the other countries because of how inhumane it is. Canadian vets are voting to ban declawing in their country. 5 Provinces have banned it so far. 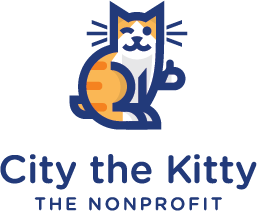 We are going to start doing City the Kitty Adoption events and will pay for the adoption fees for a certain amount of cats in shelters throughout the country. The only stipulation is that the adopters have to sign an adoption contract that says they won’t declaw the cats. Would you be interested in participating in one of these events, maybe later this year or early next year if we can expand them to other states? After all, both of our missions are to get animals into loving homes where people will truly care about their welfare and not harm them. Also, have you thought more about not offering declawing in your Wellness Centers? Isn’t that a bit deceiving to say that they are Wellness Centers yet your vets are doing a non-therapeutic, mutilating procedure that has no benefit to the cat and harms their well-being? Aren’t you concerned that your Wellness Centers aren’t educating the public about the facts about how declawing is harmful to a cat and about the easy, humane options? I’ve included some more facts about declawing that can help you understand why declawing is so mutilating and harmful. When you know better, you do better. I hope you will join us and help with our cause to protect cats from this cruelty and harm. MYTH: My declawed cat didn’t show any signs of discomfort or pain. FACT: CATS HIDE THEIR PAIN. Declawing can create chronic, severe pain in a number of ways, and cats, being stoic, deal with it. They appear normal. They may even get back to playing. They may “pretend” to scratch with their missing front claws. They may climb and jump, but none of it is normal movement because declawing has altered their entire physiology. Cats usually only show their pain and suffering when they are in a severe state or near death. A recent peer reviewed study published in the Journal of Feline Medicine and Surgery showed that no matter what method was used to amputate a cat’s toe bones and claws, it increases the risk of unwanted behaviors and may increase risk for developing back pain. It also showed that declawed cats are at risk of back pain and gait problems, retained bone fragments, and were more likely to bite and stop using their litter boxes. MYTH: Veterinarians declaw to keep a cat in a warm, loving home and out of a shelter. FACT: Declawing doesn’t keep a cat in a home. There are immediate and obvious behavior changes in many declawed cats like biting and eliminating outside the litter box. But there are also mental and emotional problems that can develop. Lots of owners of declawed cats report that their pet has become depressed, withdrawn, irritable and even aggressive after being declawed. Many owners can’t deal with these behavioral changes and relinquish their declawed cats to shelter where many of them are euthanized because they can’t find a home. Many cats are so shocked by declawing that their personalities change from being lively and friendly to becoming withdrawn and introverted. Many declawed cats become so traumatized that they end up spending their lives perched, out of reach of real and imaginary predators against which they no longer have any defense. Removing the toe bones and claws makes a cat feel defenseless. MYTH: Cats go back to normal after declawing. FACT: Their back, shoulder, paw and leg joints, muscles, tendons, ligaments and nerves are naturally designed to support and distribute the cat’s weight across its toes as it walks, runs and climbs. A cat’s claws are used for balance, exercising, and stretching the muscles in their legs, back, shoulders, and paws. They stretch these muscles by digging their claws into a surface and pulling back against their own clawhold – similar to isometric exercising for humans. This is the only way a cat can exercise, stretch and tone the muscles of its back and shoulders. The toes help the foot meet the ground at a precise angle to keep the leg, shoulder and back muscles and joints in proper alignment. Removal of the last digits in their paws causes the feet to meet the ground at an unnatural angle and that can cause back pain similar to that in humans caused by wearing improper shoes. MYTH: Declawing is a simple and easy procedure and if done by a skilled surgeon a cat will be fine. FACT: The rate of complication is relatively high compared with other procedures. Complications can include: excruciating pain, damage to the radial nerve, hemorrhage, bone chips that prevent healing, painful regrowth of deformed claw inside the paw, and chronic back and joint pain as shoulder, leg and back muscles weaken. Abnormal growth of severed nerve ends can also occur, causing long-term, painful sensations in the toes. Infection will occasionally occur even when all precautions have been taken. The pad is often displaced backwards, toward the rear of the foot, allowing the weight of the cat’s body to push the end of the second toe bone (second phalanx, or p2), through the thinned tissue on the underside of the foot. These complications may occur in combination, invariably resulting in great pain for the animal to stand or walk. FACT- Spay and neutering not only reduce the risk for them developing future health problems (i.e., pyometra, mammary gland neoplasia, and reproductive tract–related neoplasia), by preventing unplanned breeding, it prevents unwanted animals from being born. Hundreds of thousands of cats are euthanized every year in shelters. There is a difference. Spaying and neutering prevent health problems, declawing actually causes many unpredictable, potentially life-long health problems and harms the well-being of a cat. MYTH- As long as you declaw at a young age, the cat will be fine. FACT- Declawing involves cutting through ligaments, tendons, nerves, and tissue to remove the last toe bone in a cat’s paw. No matter what method, or what age the declaw is performed, it alters the conformation of the feet and physically changes everything about the way a cat walks. “Ruth I asked you some specific questions in my email. About your Wellness Centers declawing. About your refusal to educate the public about declawing and the easy humane options. About hosting a city the kitty adoption event. Please read it my email again or have your communications/pr person read it and get back with me with the answers. I’m really trying to address this privately with you but you just aren’t showing me that you truly care about the welfare of cats and are sticking with your beliefs that say it’s a lesser of two evils. Remember Ruth, there are more options than just these two horrible ones, death or declaw. I know you have it in you to be able to grasp these humane concepts that I’m presenting to you about this issue. Ruth I asked you some specific questions in my email. About your Wellness Centers declawing. – Like I said before we allow the vets to use their professional discretion on the services they offer. I did pass your emails along to them for their consideration. About your refusal to educate the public about declawing and the easy humane options. – We do pass out soft paws brochures at all of the clinics. And suggest scratching posts and teach the owners how to trim nails rather then declaw. We don’t PROMOTE declaw. We’re not refusing to educate the public but we’re not going to make the decision for them. About hosting a city the kitty adoption event. – We don’t believe in sponsored adoptions. Animals need to have value – anything “free” is easier left behind. If you can’t afford the nominal adoption fee then we feel you probably shouldn’t have a pet at this time in your life but thank you for the offer. Please read it my email again or have your communications/pr person read it and get back with me with the answers. -I don’t have one of those…lol…I’m all of that. Remember Ruth, there are more options than just these two horrible ones, death or declaw. – I honestly find that last comment offensive. I’ve dedicated my entire life and hundreds of thousands of my own dollars to saving animals. I opened the shelter with my own money with no affiliations or help and with only my love for animals fueling my fire. For the past 15 years we have saved just under 60,000 animals that were unwanted, neglected or worse. So to insinuate that I don’t “truly care about the welfare of cats” or any animal for that matter is inaccurate and insulting. I’ve seen fates MUCH WORSE THEN DEATH OR DECLAW. I appreciate and respect your passion to your cause and the dedication you have for your mission. I would expect the same in return. I don’t like being bullied any more then you do. March 7, 2019 I replied to her note. I’m sorry that you think that I’m bullying you just because I respectfully reached out to you and tried to inspire you to do the right thing and help the welfare of cats in this matter. I’m not negating all the good that you have done for animals and in fact I gave you accolades for that in one of my emails. That doesn’t change the fact that your shelter stays neutral when it comes to declawing education. You say that you don’t want to make the decision for adopters but why not give them the facts about declawing so at least they can see that this procedure will harm their cats and their cats may develop behavioral issues from the declaw like litter box avoidance, biting, and aggression. Shouldn’t they know that their cats will also most likely suffer from other negative physical consequences from their declaw. It seems like if I ran a shelter I surely would want my adopters to know the awful truth about declawing. That doesn’t change the fact that you allow declawing in your Wellness Clinics and they don’t educate the clients about what declawing is or how it is mutilating or inhumane. That doesn’t change the fact that your own staff at your shelter actually recommended going to one of your Wellness Clinics for the declaw on one of your adoptable cats because it was cheaper than a regular clinic. Your shelter is making thousands of dollars each year from this inhumane and unnecessary procedure. Most shelters/rescues now recognize the cruelty and harm of declawing and they have brochures that have declawing facts and the easy humane options to give to adopters. Many of them even have contracts that forbid adopters from declawing any of their cats. Those shelters/rescues are dealing with the exact same issues you are, but they know declawing is wrong and they want to be part of the solution to save cats from that horrific fate. Why can’t you see the benefits to these things? The facts are that when you educate cat owners about the facts about declawing and what it entails, many of them are shocked that it’s not a simple nail removal and they don’t want to put their beloved cats through that. The fact that you’ve dedicated your life to your cause and are saving thousands of animals each year is wonderful but your shelter is also condoning, performing, and profiting from a procedure that is commonly known as animal cruelty to many ethical no-declaw veterinarians and cat owners in America and in most of the rest of the world. Canadian vets are voting to ban declawing now. So far 5 Provinces have banned declawing. When they know better, they do better. I’m confused as to why you wouldn’t want to do a few easy things that would at least save some cats from being mutilated and harmed from this amputation procedure. I’m saddened that you think that it is ok to perform a mutilating amputation procedure in your Wellness Centers. Wellness Centers and vet clinics should be places that animals go to be healed , to be spay/neutered to prevent animal overpopulation, or to have therapeutic procedures performed on them, not places that they are harmed and mutilated for life. You say it’s up to your vets on the ethical side of things as they are the veterinary professionals and know much more about this subject than you do. Well, they don’t educate cat owners about the facts about declawing or the easy, humane options. They are just profiting from this cat cruelty. Do you think that is very ethical? Dr Lyon said he does over 100 declaws a year on all ages of cats by the way. He was asked if there are any long term problems with a declaw and he said he can’t guarantee that the cat will be ok long-term but that he will do the best long-term because they read some stories on the internet and the Dr Lyon said he can’t guarantee that but he can guarantee that he will do the best job possible and he’s been doing them for 35 years. He said there can be complications afterwards like infections and things like that. The majority there are no problems he said. I appreciate what you do for animals but it is truly hard to fathom how you can just dismiss doing a few easy things that would truly make a difference for the welfare of cats in your area and to help this cause to end this very inhumane and barbaric procedure. And it’s truly sad that you would say that this is bullying. Up until April 2019, the Anna Shelter was an Adoption Partner at PetSmart and Pet Supplies Plus. I reached out to these two companies to ask them if they have standards for their adoption partners and wanted to know if they are ok with any of their adoption partners declawing cats at their wellness centers and condoning declawing. In April 2019 Pet Supplies Plus told us that they reached out to the Anna Shelter and said that the Anna Shelter was unwilling to change any of their current practices so the Pet Supplies Plus store parted ways with the Anna Shelter that day. “PetSmart Charities works with nonprofit animal welfare organizations in good standing to help pets get adopted. We require the animal welfare organizations bring only healthy pets into our stores for adoption, and we have standard practices in place to help ensure these pets are healthy. Additionally, we regularly audit our partners to ensure they are in good standing. Each Adoption Partner has its own separate adoption policy which may or may not include declawing. If you would like additional information about a specific Adoption Partner, we encourage you to reach out to the group directly. I asked PetSmart if they are specifically ok with any of their Adoption Partners declawing cats or declawing at their Wellness Centers and never received a reply. Remember to always take the high road and respectfully educate.